The Pineapple brings good luck, so bring good fortune to your wedding or party with this pineapple tropical themed fan. It makes a perfect favor and will help keep guests cool. 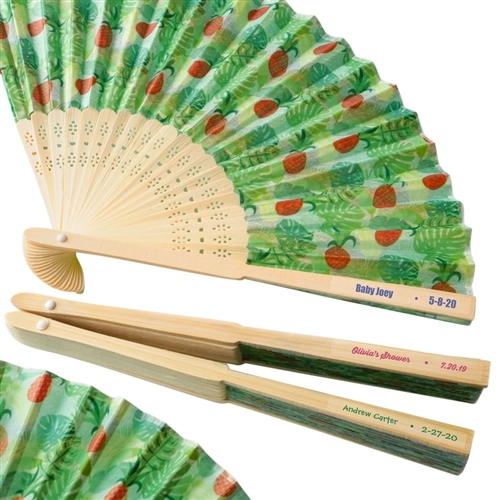 The expandable fan is made out of silk with an intricately carved handle. It, and features a unique design of pineapples and green leaves. Size: 8 1/4" x 14" open. The fan comes in a white gift box. Flamingo Place Card Holders (set of 6) Personalized Flip Flop Key Chain Filled with Sand Pineapple Invitation Set (set of 50) Personalized Cube-it Lip Balm, 3 oz.